Looking to add style and security to your property with a gorgeous new garden fence and a sturdy new gate? 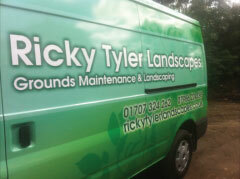 When you need a landscaping specialist to give your garden a makeover, the team at Ricky Tyler Landscapes is on hand to help. 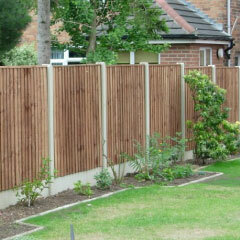 We supply and erect bespoke fencing systems for properties of all sizes and styles, with something to suit every home. Your home will benefit from having a new garden fence around it. Fencing adds privacy to your garden, and can also help control the light coming in - which is great if you get a lot of glare through your windows. It can keep animals in or out too, and protect your plants from pests. Additionally, a secure gate and a sturdy fence will deter intruders and make accessing your property much more difficult. With all these benefits and more, adding a new fence is a great way to increase your home's value and help you get the most out of your property. We can also replace damaged panels and carry out repairs to chains, boards and posts; if your fence has been damaged, call Ricky Tyler Landscapes today. In addition to our fencing services, our landscape gardeners can fit high quality hardwood decking to create patios and terraces - perfect for making the most of the summer. We've also got paving specialists on hand, and we can create walkways, steps, ramps and more. Get your perfect garden - call in the experts today.